RGB. It’s an acronym you just can’t escape these days in the PC component world. Just about every component you can think of now offers at least some form of RGB lighting. Motherboards have backlighting, glowing logos and even add-in card clips. Cases can be lit up to match the overall theme of your build. And of course there are the plethora of RGB keyboards and mice. 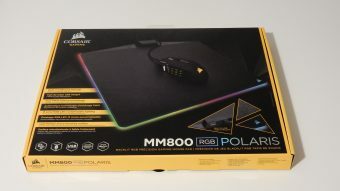 Not to leave a section of the peripheral market un-tapped, Corsair has just released the MM800 RGB Polaris mouse pad. Featuring 15 RGB LED zones, the MM800 RGB Polaris strives to make your mousing surface just as customized as the rest of your setup. There isn’t much to the average mouse pad, but the MM800 RGB Polaris has a few tricks up its sleeve that we think should be highlighted. RGB LED Lighting and CUE Integration – RGB is in the name of the product, so you know we are going to mention it here. 15 RGB LED zones allow for a highly customizable configuration. And forget about just changing the colors of the LEDS, the MM800 integrates with Corsair’s CUE application to offer customizable lighting patterns and sequences that can even be paired up with other CUE-enabled peripherals. Not feeling like having a disco-esque light show under your hand today? Simply adjust the brightness or turn the LEDs off. USB Pass-Through – While only compliant with the USB 2.0 spec, we are glad to see this as an offering, especially for when we are using a wireless mouse. Plugging in the mouse dongle allows it to stay well within the range limits, and frees up a USB port for use. 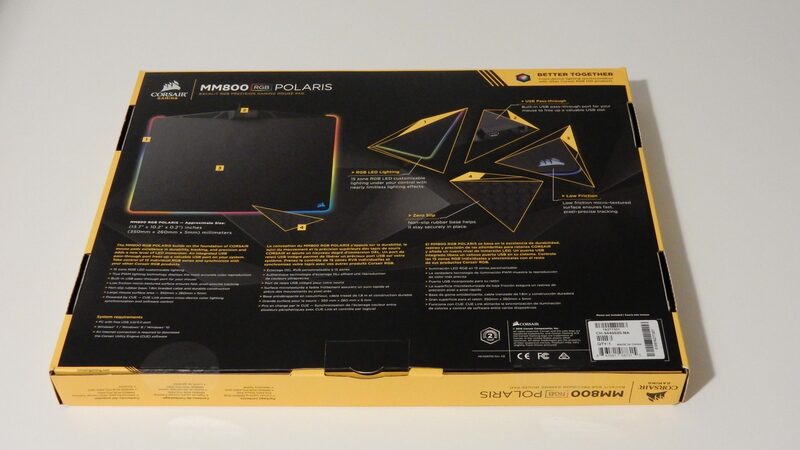 The MM800 RGB Polaris comes from Corsair in a short rectangular box that features a shot of the mouse pad, giving potential buyers a look at what is inside. The box itself features the current style of Corsair packaging, with mostly black and gray panels detailing the features found on the product, with yellow accents highlighting the box edges. 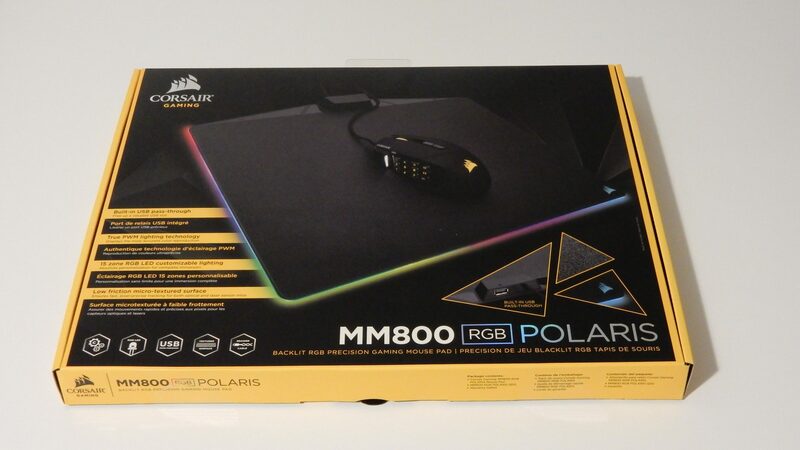 The MM800 RGB Polaris is what we would consider a medium-sized mouse pad, especially when taking into consideration the sizes offered by Corsair’s other mouse pads. Although there are 15 LED zones and their associated wiring within the body of the MM800, it is not overly thick, at just 5mm. 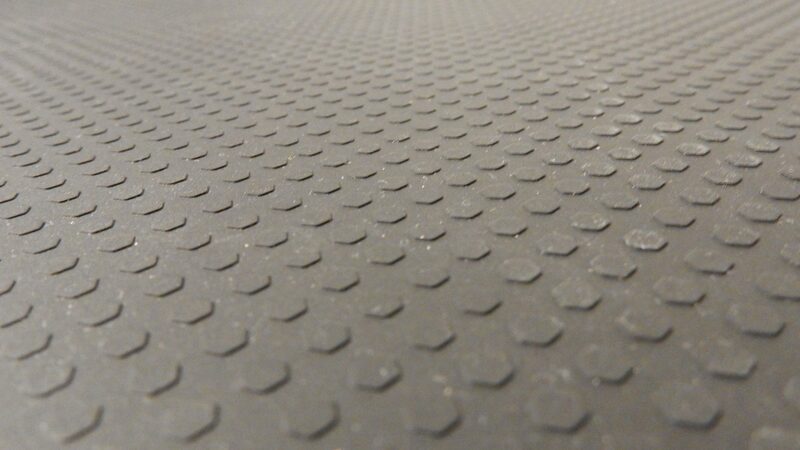 This helps to keep the edge of the mat, which is rounded, comfortable and non-obtrusive. The surface of the MM800 features a low-friction micro-textured plastic that is similar to what is found on most hard gaming mouse pads. While our personal preference is that of a cloth mouse pad, the surface is still quite comfortable, and provides a quick-moving surface for the mice we tested with. 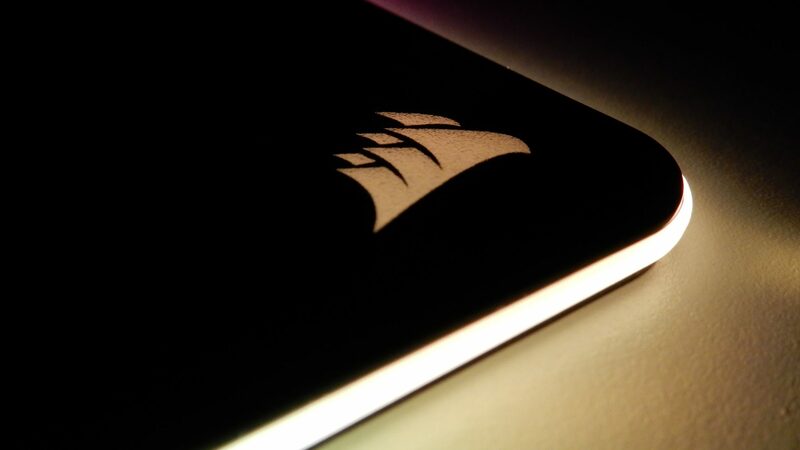 At the bottom right corner of the MM800 is a small Corsair logo that is also illuminated with the RGB LEDs inside the body of the pad. Around the sides and bottom edges of the MM800 is a semi-transparent plastic layer that is home to the 15 RGB LED zones. As listed in the Standout Features section above, the MM800 features a built-in USB pass-through port for your mouse. This makes stringing two USB cords to your case a thing of the past, and can even help out with wireless mice, providing a nearly uninterrupted signal path from the transceiver to the mouse itself. 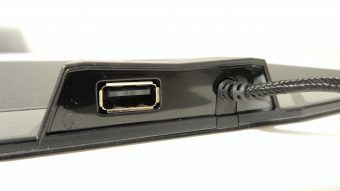 Of course, connecting a mouse to this port is not required, as it can also function as a handy spot for plugging in USB-connected flash drives, etc. The six foot long cord attached to the MM800 RGB Polaris features Corsair’s braided design and somewhat rugged, almost over-engineered, USB plug. Both the USB pass-through plug and braided cable are housed in a small, angled box at the front of the mouse pad. This area is then flanked by polished plastic shapes across the top of the pad. 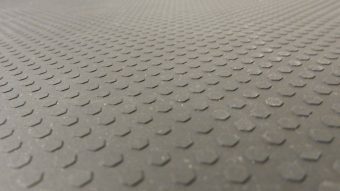 Flipping the MM800 over reveals a non-slip rubber base with a grid of slightly raised hexagonal shapes that covers the entire bottom portion of the pad. This design proved to be very grippy in our testing. 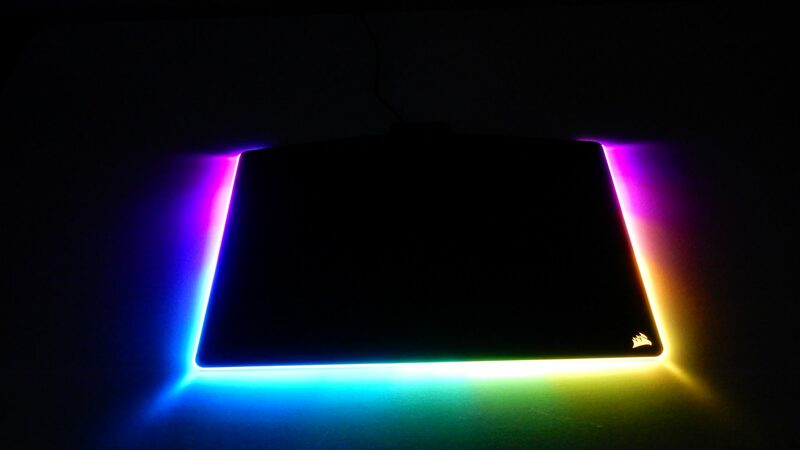 As seen below, the MM800 RGB Polaris provides an ample amount of space for your mousing needs. And while there is lots of room for a mouse to move around, a major setback that we experienced was that the angled box at the front of the pad really caused our mouse cord to catch when moving back and forth. This constant catching was noticable at all times, including standard web browsing and in gaming situations. The amount of force needed to overcome the cord catching on the box is minimal, but when the mousing surface is touted as being low friction for fast movements, that is all thrown out the window when you feel a slight tug with your horizontal mouse movements. Of course this is really only an issue with wired mice, but since that is the norm for gaming, this is a pretty big oversight in our minds. We aren’t exactly sure what all is housed in the box at the top of the pad, but we think that a wider and more rounded design might have alleviated this problem altogether. Maybe this is a job for a custom, 3D-printed clip-on cover. Now we just need access to a 3D printer. Throughout our time with the MM800, we have really liked that fact that this mouse pad stays in place at all times. The bottom hexagonal pattern is very grippy and had no problems staying in place on the various desks we have in the lab. 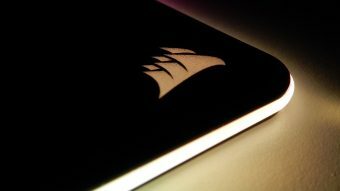 While we usually prefer a cloth-based mouse pad, the Corsair MM800 RGB Polaris provided us with not only a comfortable mousing surface, but a very smooth one as well. Quick mouse movements while testing with Overwatch proved to be very smooth, other than the mouse cord catching on the breakout box. Using the Corsair Utility Engine (CUE) allows users to customize the lighting settings on the MM800 with a few simple steps. There are plenty of pre-defined patterns and designs that can be left alone or customized even further to give your mouse pad a personal touch that matches the aesthetics of your setup. CUE even has the ability to pair up the lighting configurations of your CUE-enabled devices. We plugged in our Corsair M65 Pro RGB that we recently reviewed, and with a simple settings adjustment, the two devices were in sync with one another, which can be seen in our video below. We think the plethora of lighting options that the MM800 RGB Polaris offers users is quite impressive.Customization and personalization is the new name of the game, and Corsair is ready to play. 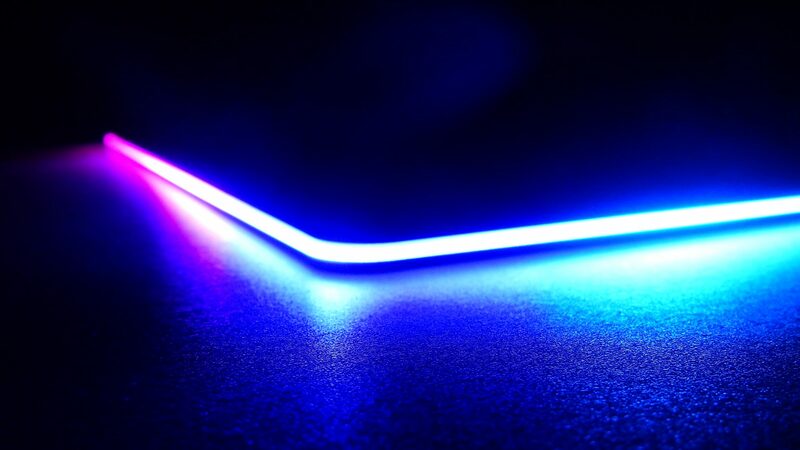 Like it or not, RGB LED lighting is the current trend in enthusiast PC components. 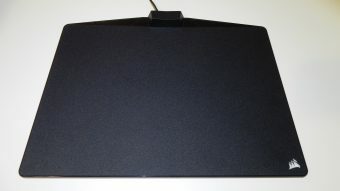 Just about every product related to PCs and gaming has some sort of lighting, and now mouse pads are included in that arena. Corsair’s MM800 RGB Polaris offering gets nearly everything right. Integration with CUE allows for loads of customization and configuration, along with the ability to ensure all of your CUE-enabled devices are in sync with one another. The MM800 also features a very comfortable and twitch-movement enabling mousing surface, all held in place by a plentiful textured rubber bottom. We said Corsair got nearly everything right with the MM800, because there is the glaring issue of the box that houses the cable and USB pass-through port. This box was constantly catching our mouse cable during our use, and while not terribly detrimental to normal use, it was really bothering us during our gaming sessions. 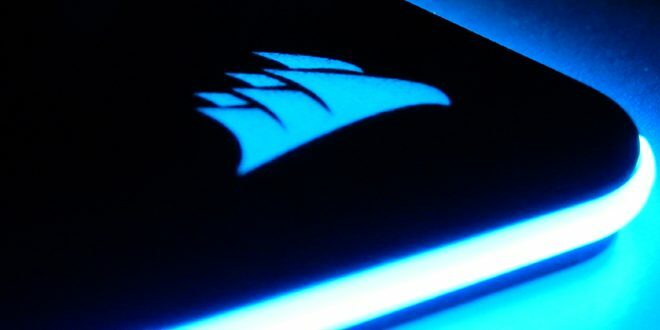 We really think this may have been an oversight on Corsair’s part, as they may have been so focused on getting the RGB LED lighting configured, that they forgot to do some usage testing in the lab. With an MSRP of $59.99 USD, the MM800 RGB Polaris may be priced a bit higher than most users would feel comfortable paying for a mouse pad. That’s where the inclusion of the RGB lighting and USB pass-through really come in to play, and help to justify the price. Were the MM800 to have a more subtle or rounded connection area that didn’t hinder mouse cord movements, it would have been an immediate recommendation to our readers. At the same time however, we think that the MM800 RGB Polaris has enough features to earn it a Bjorn3D Silver Bear Award. Featuring RGB LED lighting and CUE integration, along with USB pass-through, the MM800 RGB Polaris is a great contender in the gaming mouse pad arena.